There were 29 press releases posted in the last 24 hours and 153,151 in the last 365 days. After issuing a £2 billion loan facility, Macquarie Group are set to present at Benelux Infrastructure Forum on infrastructure and sustainable energy projects. LONDON, WATERLOO, UNITED KINGDOM, July 4, 2018 /EINPresswire.com/ -- The 17th annual Benelux Infrastructure Forum is returning to Amsterdam, Netherlands on the 21st and 22nd November 2018, with an unrivalled line-up of senior industry experts sharing their knowledge of financing mechanisms such as PPP, project financing, and green bond financing, as well as alternative markets for future sustainable investments in the Benelux region. In recent news, Macquarie Group announced the issue of a £2 billion loan facility, including £500m in green tranches. The green tranches will be initially used to support renewable energy projects, with future plans to invest in energy efficiency, waste management, green buildings and clean transportation projects. 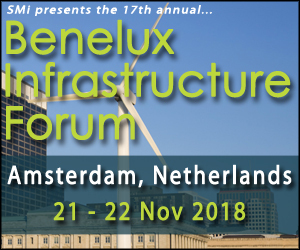 As Macquarie continues to build its reputation as a strong leader in green finance, they will be bringing their views and expertise to this year's two-day Benelux Infrastructure Forum in Amsterdam, this November. •	ABN AMRO Bank N.V.